This white flower is commonly found at Malay graveyards. Therefore, there is a very spooky feel to it. I took this photo at the Penang Youth Park, far away from any graves. Hahaha. I attached a photo filter (a lense to filter out bright sunlight, enhance colours, useful for taking photos in sunny places, to cut down reflections, enhance blue skys, yadda, yadda) earlier and the sky turned dark as a storm was coming. So, what I get is this shot of the white flower with nice shadows. It does look spooky, right? Let me share a spooky tale with you. Once, a janitor from a private hospital told me this ‘real and true story’. Long time ago, before the hospital has an incinerator (to burn things), they used to bury parts of the body, e.g. amputated legs, parts taken out from operations and also dead fetuses (i.e. those babies born/aborted/miscarried before time) at the backyard. Over there, they have this plant with white flowers. The janitor told me that whoever dare to bring a single bloom home will have their nights disturbed. This is because the flowers ‘belong’ to these ‘things’ that are buried in the plot. She challenged me to try and even pointed out the plant. Scary? Well, don’t be. When I was small, i.e. during the 70s before the invention of computer and electronic games, we used to play with these flowers. It was the favourite game for primary school girls. We would pick these flowers, from a graveyard near my primary school. Tied them into a bunch and kick them. The game is to see how many times you can kick (sorry can’t think of an appropriate word to replace ‘kick’) with one foot and balance on the other, and keep the bunch of flowers from falling onto the ground. A little like sepak raga. And nope, nothing disturbed me eventhough I took a whole bunch from the graveyard. I hope you enjoyed the little spooky tale and also like these two photos which seem to look prettier with the shadows. Added : Thanks to all the commentors especially torment and Lrong, I just learnt a new word. 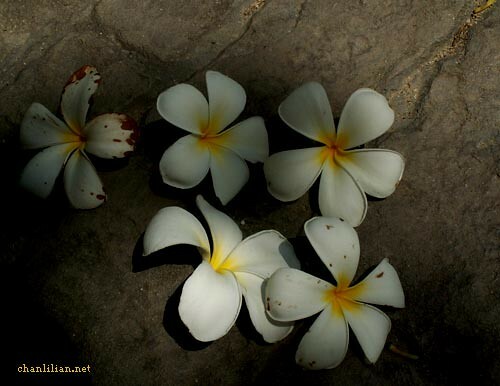 Frangipani or Plumeria is the name of the spooky white flower. There are even webbsites dedicated to this flowers! Amazing what I learnt from blogging. Hi. Do you not know even the name of the flower? 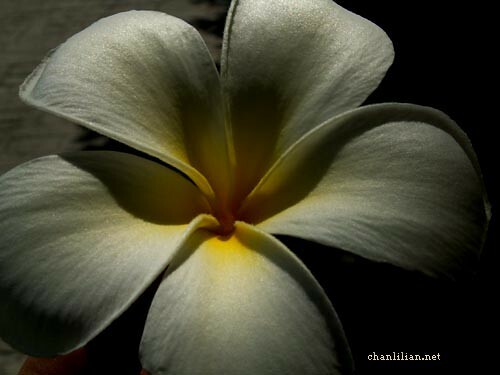 It’s frangipani (plumeria alba), one of the most beautiful trees of the tropical realm, and besides the heliconia, is one of the trademark plants of Bali. I heard those tales about the graveyard flowers thats why to this day, I refused to wear a plumeria lei when I’m in Hawaii or when friends give to me before my flight home. I guess childhood fears are hard to grow out of. PSSST Lilian, put a few bones in that second picture , you would have given me nightmares for a long time. I love them. Not at all spooky to me. The trees have nice low boughs. As a child I used to sit on the boughs and lie in a hammock strung across the boughs and day-dream or read. And yes, the blooms tied together and tossed in the air with the feet. Frangipani brings back nice childhood memories. HeY, i love this flower. When we were small, my cousins and i used to made necklcae and some fancy headgear (crowm) using this flower. What do they call this flower in bahasa , huh?